Kickboxing and boxing share a lot in common, and often the question is – which sport is better? The answer depends on the goals you have set for yourself and what you need boxing or kickboxing training for. If you are planning on training one of these sports to learn self-defense, remember that they are official sports, and as such have set rules, which exclude moves and actions which could be required at times when in need of real self-defense. If you are looking for a way to get and stay in shape, then both sports have their advantages, as they require a lot of training, exercise and burn a lot of calories. Kickboxing includes training more body parts, including the elbows, knees, feet apart from the arms and hands. These are trained as tools for hitting and attacking and as instruments for self-protection as well. Boxing largely specializes in training punches and avoiding them. Also, boxers tend to be faster than kickboxers due to the fact that they train to hit and avoid the sudden jabs of their sparing partners. Boxers want to stay closer to their opponents in order to be able to land accurate and effective punches, while kickboxers usually keep a distance from their opponents so that they can kick them efficiently by being able to extend their legs completely. Also, in boxing, the boxers usually take a sideways stance in order to limit the space on their bodies which their opponents can reach and punch, kickboxers on the other hand have a square stance so that they can protect themselves from kicks and are able to kick back themselves. In boxing, only punches above the waistline are allowed, so defending yourself is an easier task on the ring. In kickboxing, the wide range of allowed punches and kicks allow kickboxers to take a more offensive stance. Boxers train and use ducking as a typical defense move, whereas in kickboxing such a move may lead to receiving a nasty kick in the face. Another defense move in boxing is stepping back to avoid a punch. In kickboxing, stepping back will only increase the chances of receiving a full, hip rotating kick from your opponent. Boxers are allowed to engage in clinching to prevent their opponents from punching them and to get some rest. In kickboxing throwing is allowed, so if you attempt to clinch your opponent, you risk being thrown down to the mat. The biggest difference between the two sports is the kicking part. Kickboxers are allowed to use back kicks, front kicks and roundhouse kicks to kick and knockout their opponents, while in boxing of course kicking is not allowed. Boxing originated in Ancient Greece and began an Olympic event in 688 BC. Modern day boxing of course is very different. The modern boxing sport started in the UK. Kickboxing also has ancient origins, and is based on a Thai martial art called “Muay Thai” from 2,000 years ago. Yet it is a much more modern sport than boxing. Punches, such as jabs, hooks and uppercuts are used both in boxing and kickboxing and are the basic strikes for boxers. Punching combinations are of course the most important elements trained and practiced by boxers. Both sports are great for learning how to protect yourself correctly from being hit as well as to defend yourself from attacking opponents. They also both include the use of gloves which are snugly fitted on the fists. Mouthpieces are compulsory for boxing, while in kickboxing they are highly recommended. Shoes for boxing are great for kickboxing as well. Protective cups are also used in both sports while hand wrap are obligatory in boxing and recommended for kickboxers. The way in which the fist is made is the same for both sports. It has to be firm and straight in order to prevent wrist injuries and so that it can be used to deliver more powerful and accurate punches. Alternating between tension and relaxation is a must for both sports too. Should I do boxing or kickboxing? The main advantage of training kickboxing is that it has a bigger range and versatility than boxing. After all it includes training your feet, knees and elbows apart from just training your punches. With a larger range of attack options, kickboxing is the leader when it comes to diversity in training. 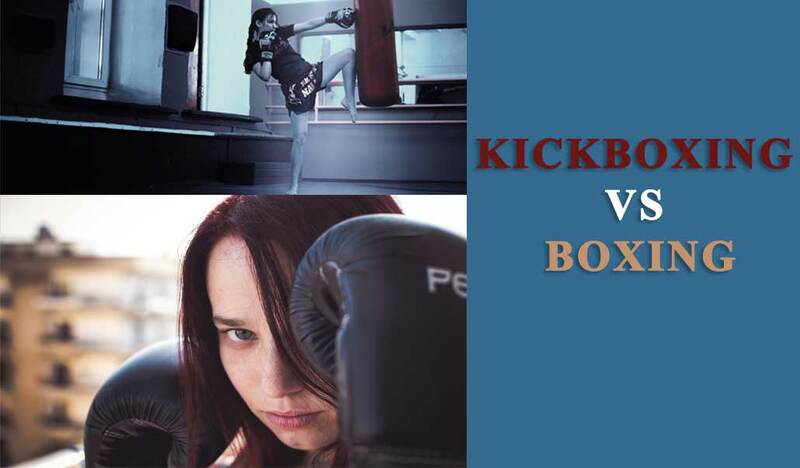 Kicking also allows for keeping your attackers further away from you which can come in handy in cases of self-defense. On the other hand, boxers are quicker when avoiding and defending punches, plus the fact that they train only their hands and arms gives them the advantage of being able to land more powerful punches too. If your goal is to lose weight and get into good shape, both sports are excellent options as they burn huge amounts of calories. Boxers who weigh 125 lbs. can burn 270 calories for 30 minutes of boxing, and those who weigh 185 lbs. will burn 400 calories for the same time given. In kickboxing, the numbers are even higher – 300 calories and 444 calories for the same time and same body weights as above. Thus for weight loss only, kickboxing may be the better choice.